I have had a few emails with questions about the glass bead corn that I am growing and selling. People often ask what it is and how it can be can be used. I figured I should write another post and answer some of the questions as well as explain my hopes for this strain of glass bead corn. 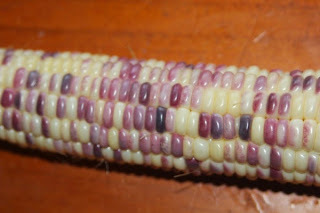 The lady who sold me the initial seeds said that she had been saving a multi-coloured "Aztec" corn and each year was keeping some of the more beautiful seeds and growing them separately to eventually make the glass bead corn variety. As glass bead corn is a morph of the Aztec corn it is theoretically possible that it may morph back if no selective pressure is maintained for enough generations, but for now the two varieties are very distinct from each other. I believe that one or more types of popcorn have added their pollen to the mix at some point in time. I have grown the multi coloured Aztec corn in the past (I was trying to track it down when I found the glass bead corn) and it is easy to see that it and Glass Gem corn are now different varieties. What can Glass bead corn be used for? Sweet corn: I mentioned in my previous post that glass bead corn can be eaten as a sweet corn - but only if you get the timing right. Both the Aztec and glass bead corn are a chewier version of sweet corn. They are apparently sweet but firmer and with a deeper, fuller, more corny taste. Sweet corn stays tender for about 3 weeks but is far sweeter when cooked within minutes of being picked as the sugars convert to starch reasonably fast. You probably only get 5 days of tenderness with the glass bead corn before they start toughening up, again they would be sweeter if cooked immediately. I am yet to eat it as a sweet corn as I am still trying to maintain as much genetic diversity as I can at the moment and selecting cobs after they have dried to hopefully breed it into something more amazing, I discuss that later in this post. Corn flour: Glass bead corn is excellent for cornmeal/flour as that is what its main ancestor, the Aztec corn, was bred for. Yellow corn is relatively low in nutrients, white corn is lower than yellow in a few nutrients, but multi coloured corn is far higher in a host of different nutrients. Corn flour made from yellow corn is yellow, when made from white corn it is white, when made from multi coloured corn it varies a lot. While I am told that glass bead corn tastes nicer, I believe that this is due to freshness and the taste is much the same no matter what colour the corn is that made the flour. Baby corn: Glass bead corn, just like any other variety of corn, can be used as baby corn. While it will produce a crop of baby corn to use in stir fry or whatever, I think that there are better varieties to use for this purpose. Varieties that have a shorter growing season, produce more cobs per plant, and grow shorter stalks are probably better suited to this task. Decorations/teaching: Some people grow glass bead corn as decorations, I love the look of it but some people dislike the look of dry corn hanging on the wall. As well as decorations some people try to teach genetics with it, personally I think that corn genetics are rather difficult and in depth (especially considering you are working with so many genes from parents of unknown lineage with a mix of alleles that may be dominant, co-dominant, recessive, transposons or retrotransposons etc I think that peas are far simpler for teaching genetics) so would not do this unless you are very confident with what you are doing or do not want to go too deep into the topic. Popcorn: Glass bead corn can be used as popcorn, but it really isn't a great popcorn yet. Some cobs clearly have popcorn as one or more of their ancestors as well as the Aztec corn. I have grown mini blue popcorn in the past and can see several of its traits so figure that it is another of the ancestors of glass bead corn. Sure a few kernels pop on every cob of glass bead corn, and on some cobs every seed will pop, but the strain that I grow has not been maintained or previously selected for popping ability. There is wide genetic variation in the population in terms of seed colour, size of cobs, leaf/stalk/sheath/silk/tassel colour, and some cobs pop much better than others. How well does glass bead corn actually pop? I think that a great popping corn could be selected from the existing gene pool and I am considering selecting and growing only the most colourful and best popping seeds. But first I wanted to know how well glass bead corn popped in general. If I chose the best cobs, pretty much all of the seeds will pop just like a variety that has been bred for popping, but that would not yield any useful data. I wanted to see what percentage of a few random batches of all the seeds would pop. This would most likely include seeds from the best cobs, seeds from the worst cobs, and seeds from average cobs. I needed to do a few batches to give me a decent idea of how it pops. From randomly selected seeds (poured out of a large jar full of seeds mixed from all the cobs, and then counted) we found that an average of 24 out of 65 seeds did not pop well. This is not a bad number already, certainly some packets of popcorn from the supermarket pop poorly like this, but it must be better if this is to be considered a good popcorn. This means that currently only about 37% of seeds do not pop properly, which makes me believe that I can turn this into a beautiful and colourful popping corn in a few generations if I select for the popping trait as clearly the required genes are present. People ask me how I will turn this strain of glass bead corn into a better popping corn. I normally tell them it is just by adding some selective pressure and growing the best seeds, many people comment that it sounds difficult. If you have no interest in saving seeds or selecting corn to pop better the rest of this post is probably not for you and will be boring. Adding selective pressure is actually a lot simpler than you may think. 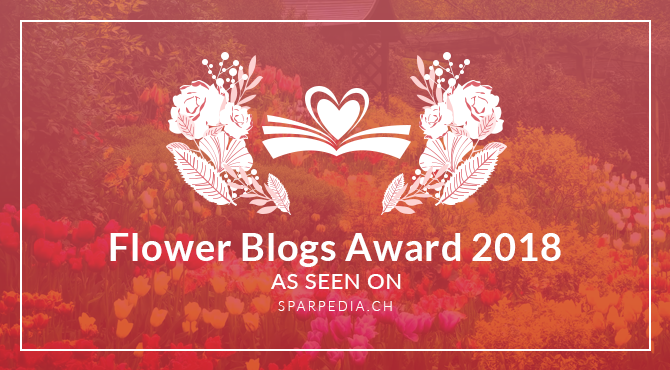 Lets face it, whenever you save seeds from anything you are adding selective pressure whether you like it or not, I may as well add selective pressure for excellence in something rather than selecting for mediocrity in everything. As there are currently no multi coloured popcorn varieties in Australia I may as well select for the popping trait and end up with a beautiful and useful variety of corn. Firstly grow the seeds and let the cobs dry on the plant as best you can, then remove them and hang them somewhere to complete drying. Discard any sweet corn seeds, glass bead corn has no sweet corn genes so this step has been done for you many generations ago. These sweet corn seeds are easy to identify as they are wrinked and shrunken when dry, not firm and round and full like the glass bead corn. The only way that Glass Bead corn will have any of this is if you or a neighbour are growing sweet corn and the pollen blows over the fence and pollinates your corn. For anyone who is into genetics you are essentially removing the genes for sugary (SU), sugar enhanced (SE) and supersweet (SH2), once these genes are gone they will not pop up again by themselves. If many seeds on a cob are cracked I don't want to save the cob for seed (unless it has a colour or some other trait I desperately want to keep) and will discard it. Cracked seeds will not pop as the pressure vessel is weakened or corrupted. This seed is fine to grind into flour or feed to stock and are not noticeable if eaten at the milk stage (as a sweet corn). I don't save the cob for seed if many of the kernels have popped on the cob. This sometimes happens due to rain or irrigation, it is ok for sweet corn, it is fine if you are to grind it into flour, it is not great for animal feed due to lowering the storage time, but it is not a good sign for pop corn. I normally get rid of the entire cob if any of the seeds have already popped as it appears to be strongly heritable. Look at how the kernels are arranged on each cob, they need to be as round as possible. They will not pop if they are flat or squished together. They will also not pop well if the seed has an indentation on the top or if the kernel is angular instead of round. Ideally the kernel would be spherical, as this is not possible in corn seeds you aim for the closest possible thing. Look at each of the remaining kernels closely, if they look glassy and translucent then they probably will pop well, if they are not they tend to be poor at popping and should be removed. As glass bead corn was created by selecting the prettiest glassy looking seeds of Aztec corn, the genes for glassy looking or translucent kernels are already present in glass bead corn. The job now is to ensure that each seed is homozygous for glassy alleles and that each generation has a higher percentage of glassy alleles. Each kernel must not have a deep indentation around the germ. The germ needs to be small and reasonably indistinguishable if the seed is to pop well. This trait is highly heritable so should be reasonably simple to select for. The only down side is that if the germ becomes too small then survivability can be lowered. If the individual kernels are overly large they will pop ok but will be tough, so I am selecting for regular sized kernels. Small kernels seem to pop well, but do not give a lot of volume, people tend to want large fluffy popcorn in their bowl. For this reason I will eventually aim more at growing medium sized kernels, but for now many of the small seeded corn cobs have all of the other traits so I am leaving a lot of them in. I need to select seeds form a large number of cobs/plants as corn is highly susceptible to inbreeding depression. Sometimes this will mean that I do not get the best popping corn traits as fast as I want to, but these set backs should only add an extra year or so to the project and ensure that this strain should be easy to continue indefinitely. After all of this I then try to select for the best colours as well as a wide range of colours. I have no intention of doing all this work to simply reinvent the wheel and ending up with a new type of yellow pop corn! I was disappointed over how many yellow seeds are currently in the cobs, for the next few years I will not plant many yellow seeds so that the presence of the yellow allele is lower in the strain. I also do not want to completely remove the yellow genes, I just want a smaller percentage of plants to carry yellow. Larger cobs produce more seeds (which means more popcorn per plant), and plants that grow several cobs per plant are better use of space in the vegetable garden, and a shorter growing season means there is less chance for crop failure and more efficient use of vegetable garden space, but these are all secondary traits that are less important than the other traits mentioned above. These traits can be selected for after the glass bead corn is a good popcorn, if you select for too many things you tend not to make any progress and the choice between what to keep and what to exclude becomes unclear. After I have applied the selection rules I end up with a bunch of seed that is colourful, glassy looking, and reasonably round. I then separate this into three batches (one to plant, two to store) to help make certain that I will not lose them if I have a bad year that results in crop failure. Every seed that is culled or does not make it into storage/planting batches can then be eaten. Each year I should move the glass gem corn towards being a better popping and more colourful corn. In a few years we will see how I went, fingers crossed I end up with a refined strain of glass bead corn being an amazing multi-coloured popping corn reasonably quickly. If that does not work I guess I could cross it with red pop corn and blue pop corn (to incorporate popcorn genes as well as adding some colour) and keep trying, but I have a good feeling that all the genes needed to make this into an amazing popcorn are already present. That's fascinating, I had no idea you could develop your own kind of strain that way. How will you protect your developing strain from cross-pollination? You can only develop a strain like this when you start with material that has a lot of diversity. It would not work if the original plants had a narrow gene pool or was already highly inbred. Many vegetable varieties have too narrow a gene pool and to create new strains one must breed them by crossing two or more inbred strains, then work to stabilise the resultant plants. I am doing a little pea breeding and a few other things like this at the moment, I should write a post on that one day. Cross pollination can be problematic in corn. We are lucky enough to have a lot of distance between us and the nearest corn, perhaps a few km. We also have a lot of tall trees and shrubs so if the wind is blowing the right direction hopefully no outside pollen gets in. It is hot and dry here which is a rather hostile environment for pollen, that combined with the isolation distance and how large and heavy corn pollen is means that for now we are safe enough. I can also grow two types of corn here if I plant them so that they shed pollen at different times. If they ever rip out the vineyards that surround us and plant corn then I will have to work a lot harder to prevent cross pollination! At least for now we are safe.